The Aeneid is a Latin epic written by Virgil in the 1st century BC that tells the legendary story of Aeneas, a Trojan who traveled to Italy, where he became the ancestor of the Romans. The first six of the poem’s twelve books tell the story of Aeneas’ wanderings from Troy to Italy, and the poem’s second half treats the Trojans’ ultimately victorious war upon the Latins, under whose name Aeneas and his Trojan followers are destined to be subsumed. The poem was commissioned from Vergil by the Emperor Augustus to glorify Rome. Several critics think that the hero Aeneas’ abandonment of the Cartheginian Queen Dido, is meant as a statement of how Augustus’ enemy, Mark Anthony, should have behaved with the Egyptian Queen Cleopatra. Must pass the Stygian lake, and view the nether skies. And bear them safely treasur'd in thy breast. And there shall end thy labors and thy woe. For Phoebus will assist, and Fate the way will find. "I sing of warfare and a man at war. Baleful Juno in her sleepless rage. THEY CAN, BECAUSE THEY THINK THEY CAN! Now, isn’t that a nifty quick analysis of how faith works? That’s Virgil talking! Faith in oneself... or Faith in a Higher Being? “What god can help me tell so dread a story? Read as part of my A Levels. 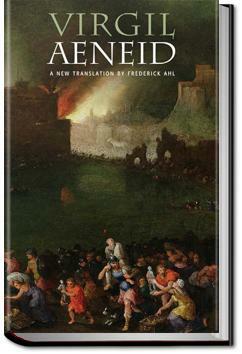 3 out of 5 stars to The Aeneid, a classic work written in 17 BC by Virgil. "La fortuna favorece a los valientes."